BUSHKILL, PA (Summer 2017) – The Villas and Fernwood Resort are offering special Pocono Mountain hike and stay packages with Bushkill Falls starting from just $176 a night midweek in a fully appointed studio villa. Gina Bertucci, spokesperson for the Resort, said, "Bushkill Falls is truly one of the Pocono Mountains natural wonders and has been called Pennsylvania's Niagara Falls. Located just minutes from The Villas and Fernwood, this series of eight waterfalls is accessible through a network of hiking trails which offer spectacular views of the falls including the 100 foot Main Falls. This amazing natural attraction is really a worthwhile adventure that is a must see." Bushkill Falls hike and stay packages include two tickets to Bushkill Falls and two nights’ villa accommodations. Additional tickets are offered at a discount to resort guests. The Villas and Fernwood Resort are a 400-acre four-season vacation destination property in the Pocono Mountains that offers a long list of on site attractions and amenities including Blue Lightning all season tubing, Pocono TreeVentures aerial ropes adventure course, Pocono Zip Racer dual 1,000 ft racing zip lines, Pocono KidVentures children’s rope courses, Pocono Zip Quest hybrid zip line course, golf on its 18 hole par 71 course, indoor and outdoor pools, live entertainment, Wintergreens Patio Grill with lakeside dining and summer theme nights, canoeing on the Delaware River, horseback riding, massage, paintball, bumper boats on the lake, miniature golf and a game room. 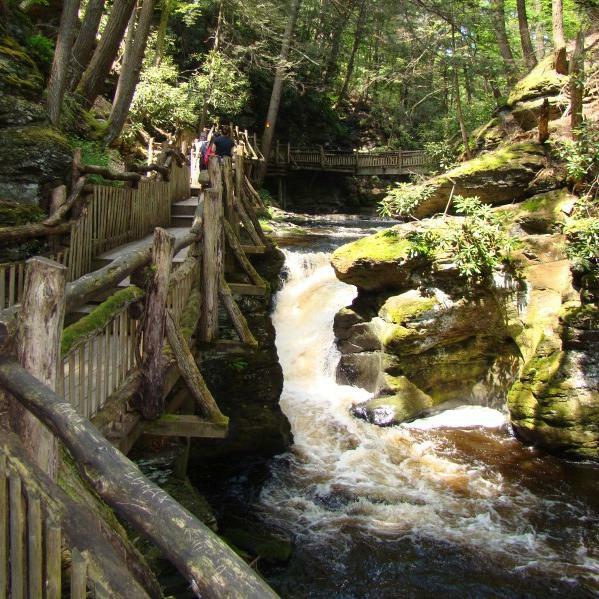 To reserve your Bushkill Falls hike and stay package, go to FernwoodResortPoconos.com. Other special packages are also offered that include tickets to nearby attractions, golf, shopping, Camelbeach, Quiet Valley and festivals at Shawnee Mountain. The Villas and Fernwood Resort are located on Route 209 in Bushkill, PA adjacent to the Delaware Water Gap National Recreation Area. Bertucci concludes, "With so much to do in the Pocono region and our close proximity to New York and New Jersey, we recommend you plan to stay a few nights to fit it all in, especially if you can make it a midweek stay when there are fewer people and even more open space to enjoy the beauty of the Pocono Mountains. How ever long your visit, Bushkill Falls is something to behold and well worth including in your itinerary."